Because we are all about taking care of the whole person – mind, body and soul – we offer you a range of services that all work together to benefit you. We conduct an initial assessment and consult with you about a treatment plan to ensure we create your own personal ‘blueprint’ to restore you back to health and peak performance. Welcome to the Peak16 program! The Peak16 program is primarily aimed at addressing the needs of our passionate and growing body-building and fitness athlete community. After working in the fitness industry for over two decades, and with a wide variety of fitness athletes, both amateur and professional, it’s become glaringly obvious that this is a community that has been overlooked for the intense focus and drive it takes to be successful. The life of the fitness athlete is one of isolation, selfish sacrifice, repetition, constant awareness of injury, self-induced mind games, scrutiny, subjective evaluation, micro-focused intensity, meticulous attention to details, high risk and very often low pay off. But the passion and addiction to crafting the “perfect” physique is a constant and never-ending personal struggle. The Peak16 program aims to reduce the challenges, make the journey more enjoyable and more rewarding. Our team has worked with such names as: Ronnie Coleman (8x Mr. Olympia); Jay Cutter (4x Mr. Olympia); Paul Dillet, IFBB Pro; Laura Binetti, IFBB Pro; Ben Pakulski, IFBB Pro, Fouad Abiad, IFBB Pro, Bob Weatherill, IFBB Pro; Frank McGrath, IFBB Pro; Natalie Thompson, IFBB Pro; Lise Thexton, IFBB Pro, and many at the amateur ranks such as: Valerio Moscariello, Dorian Hamilton, Daryl Burke, Jason Green, Eva Lam, Vince Walters, Cat Bertoni, Tracy Tink, Renee Dejardin, and the list goes on and on! 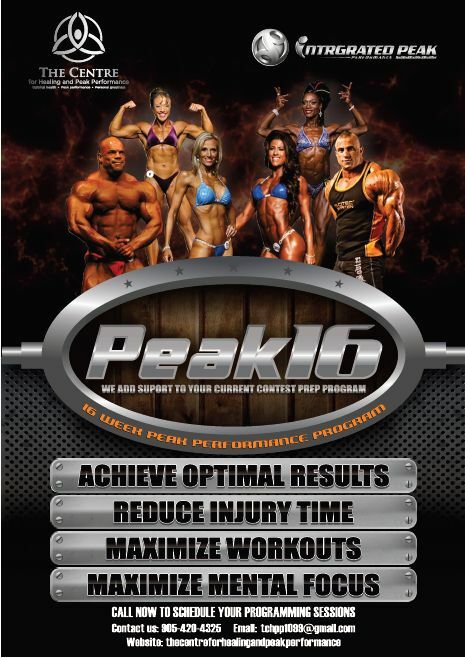 The Peak16 program is a 16-week process that works with your current coaching plan and aims at helping fitness athletes on four levels: achieving optimal results during their prep; preventing and reducing injuries; maximizing their workouts; and maximizing their mental focus and concentration. Our team of professionals work together to help you achieve the results you desire. Call now to start your peak performance process. As always, all initial 20-minute consultations are free. Chiropractors use manual therapy – their hands - to provide treatment to clients and preventative care for disorders related to the spine, pelvis, nervous system and joints. Depending on the specific needs of an individual client, a chiropractor uses a combination of treatments to help to maintain proper alignment of the joints and spine and support optimal health. The first step is to take a complete health history to accurately diagnose a patient, then a chiropractor can develop and carry out a treatment plan, recommend therapeutic exercise and other non- invasive therapies, and provide nutritional, dietary and lifestyle counseling. There is a long-held belief that the mind, body, and spirit are interlinked. It’s not a far stretch of the imagination to think that if one of these elements is out of balance, it will have an effect on the other. Just think about the last time you had a chronic injury, lasting more than two weeks. The typical reaction is to find that over time, the physical injury begins to affect you on a mental and spiritual level. When you are experiencing a dysfunctional state, especially for a prolonged period of time – examples can include anxiety, stress, phobia or chronic pain – it can eventually lead to a stagnation and alteration of your health and energy balance; and be felt as “dis-ease” within the body. To effectively return the body to balance and optimal health, we need to consider all the variables that can affect mind, body and soul. EBRT is a culmination of three effective mind-body concepts and techniques. The concepts and techniques involved are: energy medicine, psychoneuroimmunology, and cranial osteopathy. These three powerful techniques and concepts will help the individual finally unlock the barriers that prevent them from healing. Using the techniques involved in EBRT liberates the tissues and balances the body’s various systems, which will allow the flow of energy to resume, therefore facilitating the body's inherent, or natural healing capacity, and an eventual return to a healthy state of being on all levels. Remember, although EBRT deals with implementation of strategies to help the individual rethink and reorganize their belief about their injury, it is not a replacement for psychological consultation or psychological treatment that requires a medical intervention. If you believe that your issue has a deeper psychological nature, then we can help by referring you to other resources outside of our Centre that can assist you further. The benefits of group coaching are astounding; new perspectives on how to look at different issues, the value of learning through other participants’ experiences, and a sense of community through learning and support that you are not alone. 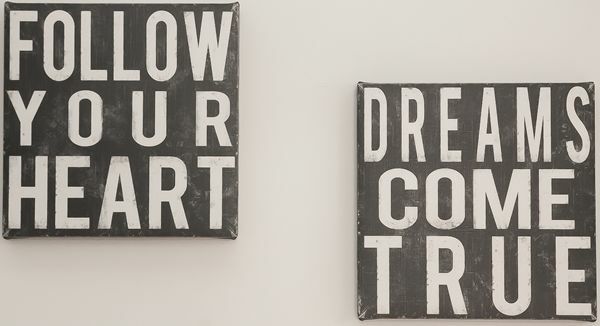 We create an open coaching environment where the flow of ideas is encouraged and you’re welcome to voice your opinion. The IPP program was created when Alvin Brown began to notice the amazing similarity between entrepreneurs and executives who play and work at a higher level, and the elite athletes and performers who also are expected to play their game at the highest level. Day in and day out, the entrepreneurs and executives are expected to not only “show up” to work, but they must also be able to consistently deliver higher and higher levels of results in a very competitive marketplace, no matter what area of business they are in. The entrepreneurs and executives must have mind, body, and soul connected and resonating in alignment each and every day to deal with the increasing demands of our world today, and to tap into their creativity in order to innovate and grow. The IPP program helps professionals and high performance athletes restore, maintain, and improve in their business, sport, and life in order to consistently perform at the elite level that is called for to produce results that keep them in the game. This program also helps them to be consistently on top of their game by dealing with the ever-changing and ever-challenging business marketplace. A unique program geared at giving the client efficient strategies that enables them to effectively deal with life’s numerous trouble spots. Life strategies coaching is a combination of techniques including those used in neuro-linguistic programming (described elsewhere in this section) and a number of personal success programs. Our coaching program helps clients gain clarity, find their purpose, reduces stress, and eliminates anxiety and phobias. Massage therapy improves circulation by bringing oxygen and other nutrients to body tissues, relieving muscle tension and pain, increases flexibility and mobility, and helps clear lactic acid and other waste, which reduces pain and stiffness in muscles and joints. Most massage therapists often incorporate a number of complementary therapies within their treatment session in order to help their clients heal from injury and pain. Meditation has been used for thousands of years and throughout all cultures to aid in the spiritual development of human beings. Attend the Centre’s Integrated one on one meditation program to maintain the healing energy benefits you receive from us in between sessions. Ask about our one on one meditation and book your free 20 minute consultation with us today! Naturopathic medicine is a distinct health care discipline that blends modern scientific knowledge with traditional and natural forms of medicine. The naturopathic philosophy is to stimulate the healing power of the body and treat the underlying cause of disease. Symptoms of disease are seen as warning signals of improper functioning of the body, and unfavourable lifestyle habits. Treating both acute and chronic conditions, naturopathic treatments are chosen based on the individual patient. In addition to diet and lifestyle changes, natural therapies including botanical medicine, clinical nutrition, hydrotherapy, homeopathy, naturopathic manipulation and traditional Chinese medicine/acupuncture, may also be used during treatments. Neuro-linguistic programming encompasses the three most influential components involved in human experience: neurology, language and programming. The neurological system regulates how our bodies function, language determines how we communicate with other people and our programming determines the kinds of models of the world we create. Neuro-linguistic programming describes the fundamental dynamics between mind (neuro) and language (linguistic) and how their interplay affects our body and behavior (programming). Neuro-linguistic programming helps to kick bad habits, overcome fears, improve speech impediments, and anything else neurologically based. Osteopathy is a treatment that focuses on the body as a whole. It uses the idea that the body functions as a unit, not just as separate entities. Osteopathy treats the restriction of motion within the body which is often due to traumatic or postural stress causing muscle tension and pulling on the soft tissues of the body. Our practitioners use specific techniques to improve functions of the body’s structure, muscles, tissues, organs, and the movement of bodily fluids. This variety means that a greater scope of conditions can be treated by using osteopathy. Physiotherapists combine in-depth knowledge of how the body works with specialized hands-on skills to assess, diagnose and treat symptoms of illness, injury or disability. Your physiotherapist’s assessment may include measures of body functions, strength and weakness testing, and analysis of gait, posture, balance, joint range of motion, and functional movement. With a client’s independence in mind, a physiotherapist’s goal is to restore, maintain and maximize your strength, function, movement and overall well being. The word ‘reiki’ consists of two Japanese words – ‘rei’ which means “God’s wisdom or the higher power” and ‘ki’ which is “life force energy”. So reiki is actually “spiritually guided life force energy.” Reiki is a Japanese technique for stress reduction and relaxation that also promotes healing. A reiki treatment usually produces feelings of deep relaxation and many people feel a glowing radiance that flows through and surrounds them. It is administered by “laying on hands” and is based on the idea that an unseen “life force energy” flows through us and makes us feel alive. If one’s “life force energy” is low, then we are more likely to get sick or feel stress, and if it is high, we are more capable of being happy and healthy. 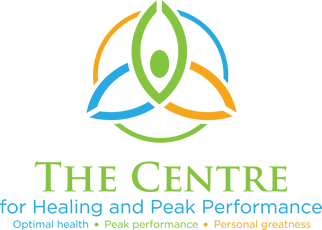 Begin your journey to health and peak performance today.